Western Writers of America annually honors writers for distinguished writing about the American West with the Spur Awards. Since 1953 the Spur Awards have been considered one of the most prestigious awards in American literature. Spurs are given for the best western historical novel, best western traditional novel, best western contemporary novel, best short story, best short nonfiction. Also, best contemporary nonfiction, best biography, best history, best juvenile fiction and nonfiction, best drama, best documentary, and best first novel as well as best first nonfiction book. 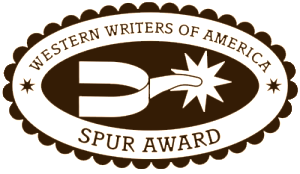 Winners of the Spur Awards in previous years include Anne Hillerman for Spider Woman’s Daughter, T. J. Stiles for Custer’s Trials: A Life on the Frontier of a New America, Sandra Dallas for The Last Midwife, Taylor Sheridan for “Wind River,” and David Grann for Killers of the Flower Moon. The Spur Awards are open to nonmembers as well as members. The 2019 Contest is now closed. Rules for the 2020 contest (which is for material published in 2019) will be posted on this site in August. In a rule change, all material published during the period January 1, 2019 through August 31, 2019 must be entered no later than October 1, 2019. Anything published from September 1, 2019 through December 31, 2019 must be entered no later than January 15, 2020.